Josephus says that every legionary carried a pick-axe (dolabra), a basket, a saw, a sickle, a leather strap, and an unknown item often translated as "chain" but probably something completely different. 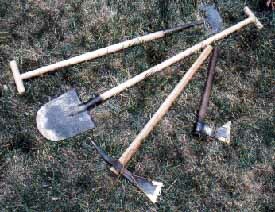 Other tools included the entrenching tool (ligo) and several types of shovel. 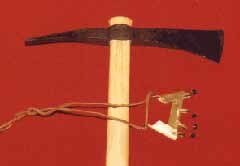 The popular "turf cutter" may also have served as a bark stripper. Most likely each man had a digging tool plus one or two of the other items. The leather strap would be useful for carrying turf blocks, as seen on Trajan's column. Baskets may be willow, reed, or split oak, and often looked much like modern wicker wastepaper baskets. The turf cutter above was modified from a modern "chopper" by Tom Kolb. 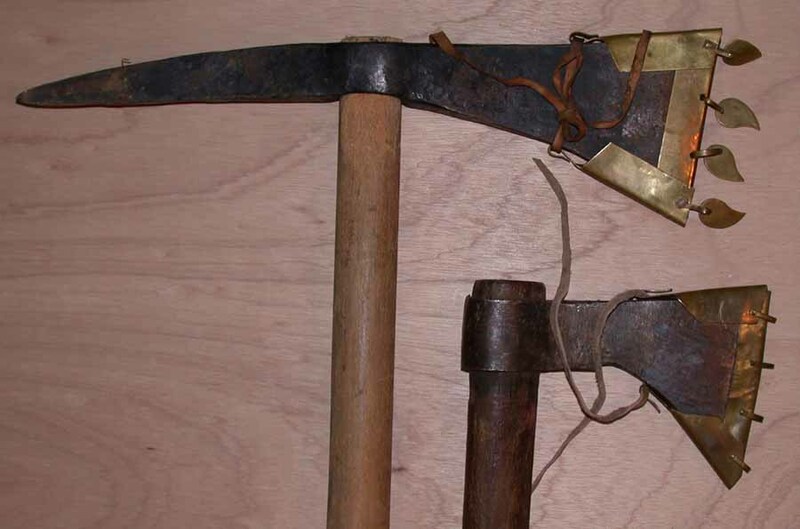 The shovel head is a forged 18th century style from G. Gedney Godwin, http://www.gggodwin.com/470.htm. The dolabra is from Albion Swords, Ltd, and the hatchet is an 18th century forged tomahawk with a Roman edge sheath. Hand-forged dolabra, with haft and sheath by Mike Cope. Albion's is very similar, but Deepeeka's is not very good (too large, and should not be polished). The palisade stake was known as vallis or sudes, not "pilum murialis" (that was probably some sort of javelin). It is about 5 feet long and can be made from a 2x2, preferably oak. Some examples, like those shown below, are c. 4" square. The stake tapers straight to a point at both ends, and the middle is narrowed to form a "handle". These are NOT fine woodwork! Some were better made than others, but most were very quickly made and show clear tool marks. They should not be sanded smooth, much less stained or oiled. A legionary may have carried one or two stakes, but they were not apparently part of the regular marching load. Just how these stakes were employed is still debated, since they are not shown in artwork at all. They could have formed a fence on top of the rampart, or a cheveux-des-fris along the front or in the ditch. They can also be tied in threes to form large "caltrop" barriers, or lashed in pairs at intervals along a log or beam to form a movable barrier. Quite possibly they were used in several ways on any particular fortification. Experiments that show them to be easily pulled out if used as a fence are all done by driving them into a finished rampart, but more likely they were inserted into the rampart as it was built and the soil packed around them, so that half their length was buried. This way they would still reach up beyond the bottom edge of a defender's shield, and be much harder for an attacker to pull out.